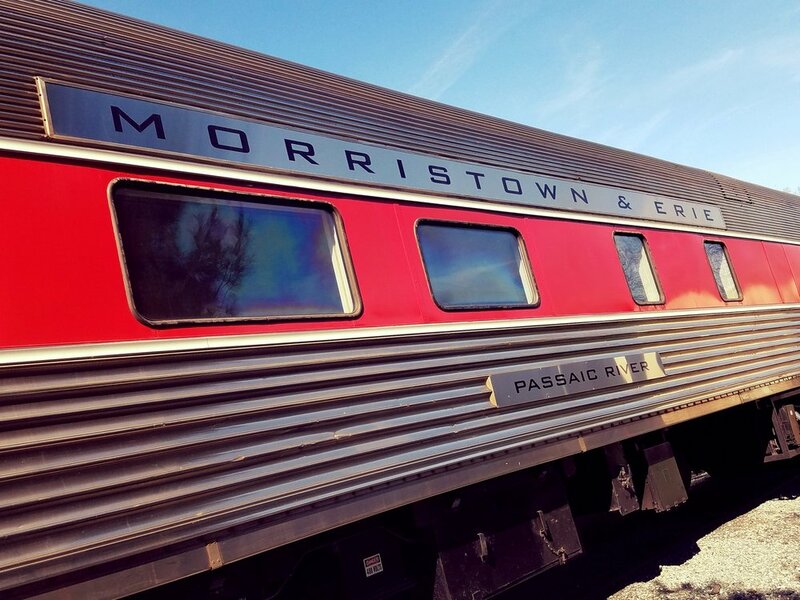 The Morristown & Erie Railway offers a number of passenger railcars for charter and private events, as well as storage and rebuilding services for privately owned cars. With a fleet consisting of Parlor Cars, Lounge Cars, and tradition long-distance Coaches combined with over 30 years of experience in the private railcar industry, the M&E offers a complete package of passenger car options for your every need, whether you are looking for a car to ride or a place to keep a car of your own. The Morris County is a parlor car equipped with reclining swivel chairs at spacious picture windows. The nostalgic railroad environment is the perfect setting to watch the picturesque view of the passing scenery. With a full industrial-grade kitchen equipped with a stove, oven, freezer, and refrigeration, this car is outfitted to prepare exquisite on-board meals. The comfortable chairs, picture windows, and full service kitchen make the Morris County the perfect standalone car for both a short day trip and long distance travel. This car is currently certified by Amtrak and available for charter. The Passaic River is a buffet-lounge car capable of seating 8 passengers in parlor chairs, 24 passengers in six booths, and 8 more passengers in lounge seating. The nostalgic railroad environment is the perfect setting to watch the picturesque view of the passing scenery. With a kitchen equipped with an oven, freezers, and ample refrigeration, this car is perfectly outfitted for a cocktail hour or social gathering. The Birken is a diner-lounge capable of seating 56 passengers at 14 tables. With warming ovens and refrigerators in the bar and buffet area, the Birken is an excellent venue for a cocktail hour.The Birken can also be paired with a dining car or another passenger car to seat your guests for a full meal while riding America’s scenic rails. Built as a 56-seat coach by the Budd Company in October 1946, the Cedar Knolls began its career as the New York Central Railroad's class-leader of long distance coaches in their "Great Steel Fleet" numbered 2900. It was later transferred to the Penn Central in 1968 retaining its original number and eventually became part of Amtrak in 1971 and renumbered 5640. In the 1990's, the car was sold through various private hands and was rebuilt into a 54-seat coach and was finally purchased by the Morristown & Erie Railway in 2003 and operated on the Maine Eastern Railroad, named Ash, before returning to New Jersey in 2016 being renumbered to 5600 and named Cedar Knolls. The Stony Brook was built side-by-side its sister, Cedar Knolls, in October 1946 for the New York Central Railroad numbered sequentially behind it as 2901 and had an identical career serving for the Penn Central between 1968 and 1971 until ownership transferred to Amtrak and was renumbered 5641. It, like the Cedar Knolls, passed through various private owners beginning in the 1990's being rebuilt into a 54-seat coach and was purchased by the Morristown & Erie Railway in 2003 for service on the Maine Eastern Railroad, named Elm, until the car returned to New Jersey in 2016 and was renumbered 5601 and had its new name Stony Brook applied to the car. The Ridgedale entered service for the Florida East Coast Railway in 1946 numbered 6263, named Jacksonville, as a 56-seat coach built by the Budd Company. Among its resume, it was operated by Seaboard Air Line and Seaboard Coast Line as its original number until transferred to Amtrak and renumbered 5627. It was sold into private hands in the 1990's being rebuilt into a 54-seat coach and served in tourist service in Canada before being purchased by the Morristown & Erie Railway in 2003 to operate on the Maine Eastern Railroad during its time being numbered ME 1003 named Magnolia. The car returned to New Jersey in 2016 and was renumbered 5603 and had its new name applied, Ridgedale. Morristown was constructed by the Budd Company for the Atchison, Topeka & Santa Fe Railway in 1953 as a 46-seat coach numbered 2834 operating between Chicago and Los Angeles. The car was transferred to Amtrak and wore numbers 4826 and 4709 before being rebuilt with 58 seats for Amtrak's Clocker Service between New York City and Philadelphia in the 1990's before being purchased by the Morristown & Erie Railway in 2003. 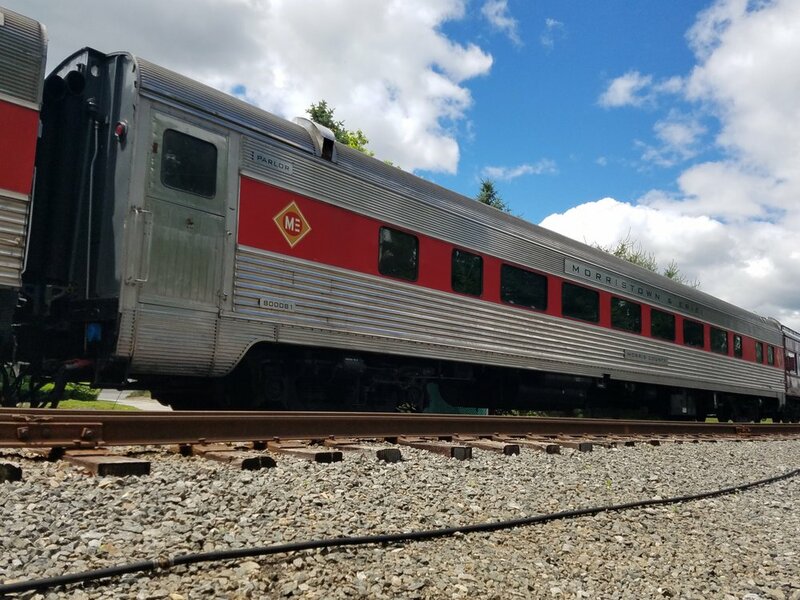 The car wore the name Pine during its time on the Maine Eastern Railroad before returning to New Jersey in 2016 being renumbered 5602 and renamed Morristown.